This article first appeared in Personal Wealth, The Edge Malaysia Weekly, on June 19, 2017 - June 25, 2017. Robo-advisers are forecast to take at least 15% market share of the Asian wealth management industry in the next seven years. Platform providers highlight the innovations that are driving the industry forward and debunk common myths about the financial technology. Robo-advisory platforms have grown exponentially in Asia in the past two years. Innovations have resulted in enhanced and more sophisticated offerings for investors. This will only propel the growth of the industry. Bhaskar Prabhakara, co-founder and CEO of Singapore-based robo-advisory platform WeInvest, expects robo-advisers to take at least 15% market share of the Asian wealth management industry by 2025. “There is a strong case for this. We went to many countries to talk to regulators and look for partners and everywhere we went, people acknowledged the fact that the robo-advisory wave — a digital wealth tsunami — is coming,” he says. According to KPMG’s Robo Advising: Catching Up and Getting Ahead white paper published in September last year, the digital advice market is projected to reach US$500 billion by 2020 while robo-advisers’ assets under management are forecast to hit US$2.2 trillion. This translates into a whopping 68% growth driven by existing and newly invested assets. “From a consumer perspective, there are a number of trends fuelling the growth of digital advice. These include increased transparency into investment options and decisions, increased accessibility through low or no minimums and fees, enhanced customer experience via web and mobile apps as well as the use of exchange-traded funds (ETFs) to build diversified portfolios,” says the report. Many of the robo-advisory firms around the world started out by offering dedicated fund management services before evolving into algorithm-based portfolio rebalancing and now fully automated or hybrid (with human adviser assistance) models. In Asia, more players have joined this space to provide value-added products and services beyond basic portfolio management. These include account aggregation, which offers a consolidated and holistic view of one’s financial health, and customisation, which optimises a client’s portfolio based on his risk tolerance and investment horizon. WeInvest, for example, offers investments in various asset classes denominated in several currencies. Clients can invest directly in equities, bonds, funds, ETFs and structured notes, among others. The company, which started out as an asset class performance comparison portal in mid-2015, has evolved into a digital wealth management platform providing fully-automated and adviser-assisted investment services. It has adopted both business-to-business (B2B) and business-to-consumer (B2C) models and offers numerous portfolio strategies, thematic baskets and aggregation services. WeInvest’s Personal Financial Aggregator by TrackWealth aggregates the multiple financial accounts of clients and provides them with visual information on their total assets, how much returns they have made as well as where and what these assets are. Clients can access this service via a secure website or mobile application. Prabhakara says the consolidated view of their accounts helps clients gain insights into their assets and set better investment objectives. “We are building something robust and secure that will stand the test of time. Therefore, we have adopted both B2C and B2B strategies. WeInvest, which uses a goals-based investing methodology, generates portfolio strategies for its clients based on their goals, risk appetite and investment time frame. The portfolios are rebalanced periodically or depending on market conditions. The platform, if given the mandate, can execute portfolio changes automatically and notify the clients. But for clients who do not provide such mandates, the platform notifies them to obtain their approval before executing any changes. Prabhakara says the company not only uses goal-based investing but also thematic investing. For instance, it offer investors the opportunity to buy into a basket called Yummy, which comprises food and beverage stocks such as The Coca-Cola Company, Starbucks Corp, Mondelez International Inc, The Kellogg Company and The Kraft Heinz Company. WeInvest currently offers 17 themes such as Rising Rates, Singapore REITs, Stable US Consumer Giants, Resurgent Industrial and US Tech Leaders. Each basket has a different volatility level. The minimum investment amount for these baskets range from US$2,000 to US$12,700. The company introduces new thematic baskets based on market conditions. Prabhakara says the baskets are transparent and investors know exactly what stocks they are buying into, as the holdings of each basket is displayed on its website. “People may go to a brokerage firm and buy all the stocks in our basket. But there are two things they cannot get. First, the fee they pay at the brokerage as a retail investor is higher than the fee we pay as an institutional investor,” he adds. 8 Securities, a Hong Kong-based robo adviser, has also evolved over the years. As one of the pioneers in the region, it launched 8 Now! in March 2015. At the time, the platform offered investors 16 equity and bond ETFs listed on the US stock markets for a minimum investment of US$1,000. It charged an annual fee of 0.88% of the investor’s portfolio, according to executive chairman Mathias Helleu in an interview with Personal Wealth. Last year, 8 Securities launched Chloe, an artificial intelligence (AI) and machine learning-powered robo-advisory mobile application. For a minimum investment of US$88, the app gives investors access to ETF portfolios with exposure to 50 countries, 37 industries and 4,324 stocks and bonds. There is an annual fee of 0.88% of the investor’s portfolio. Hybrid robo-advisers have gained traction in the region as both financial institutions and investors are receptive to this model. On the one hand, financial institutions can ride the digital transformation wave, eliminating the risk of being cannibalised by the financial technology (fintech) disruption. On the other, investors can combine the benefits of digital portfolio management and the assistance of human advisers in making investment decisions. According to independent research firm MyPrivateBanking Research, the assets under management (AUM) of hybrid robo-advisers are expected to grow to US$3.7 billion by 2020 and US$16.3 billion by 2025, which will constitute just over 10% of the investable wealth then. “By comparison, pure robo-advisers will have a market share of 1.6% of the total global wealth at that stage,” says the Hybrid Robos: How Combining Human and Automated Wealth Advice Delivers Superior Results and Gains Market Share report published in last February. Robo-advisers such as WeInvest and Bambu, which offer hybrid models, are convinced that they will do well not just in their home countries but also in the countries they expand to. Prabhakara says WeInvest would appeal to investors who want to manage their own investments or those who prefer to invest with banks or asset management firms that use its platform. Jenna Lee, co-founder and CEO of South Korea-based Automated Investment Management (AIM), says the robo-adviser industry has huge growth potential, but it has to provide quality advice at low fees and be transparent to grow further. Some robo-advisers in her country, she points out, charge clients high fees and sell expensive products, such as unit trusts, which may not perform well. adviser to offer a B2C automated investment advisory service. It only provides NYSE-listed ETFs as it wants to keep the investment cost low. There are currently more than 1,510 ETFs listed on the NYSE. “If we had a B2B strategy, we would not be able to control the fee, which is set at 0.5% of the client’s AUM per annum. We want to make sure that our platform charges a low fee for investors who want a portfolio of ETFs. That is why we are only in the B2C market,” says Lee. 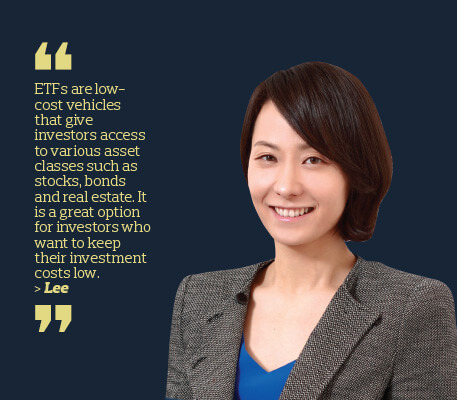 Lee says ETFs are low-cost vehicles that give investors access to various asset classes such as stocks, bonds and real estate. It is a great option for investors who want to keep their investment costs low. Ned Philips, founder and CEO of Singapore-based robo-adviser Bambu, says the wealth management market in Asia is clearly segmented into high-net-worth, affluent and retail offerings. “Each segment has different needs, so we have developed different solutions for these segments. “Retail clients are often first-time investors and need guidance, which we provide through goals-based financial planning tools. Due to the high volume and low margins, this segment cannot be served by relationship managers. Therefore, we offer them self-service on our digital platform. Philips says Bambu decided to adopt a pure B2B strategy due to the market conditions in Asia. The fragmented regulatory environment and high cost of acquiring customers are not favourable for start-ups. The B2C strategy, he adds, would take too long to achieve any meaningful traction and the capital requirements would result in a landscape controlled by the company’s funders. “Bambu decided to offer robo-advisory solutions to those that already have a licence. We offer an innovative fintech solution with fast time-to-market. We do not report or charge based on AUM. We are a software as a service (SaaS) technology company that charges based on the amount of users,” says Philips, adding that the company charges institutional clients a monthly fee of US$1 per user. The default model for most robo-advisers is a passive ETF portfolio, he says. This certainly has the benefits of cost efficiency, liquidity and zero to low minimum investment. “There are two main challenges in the Asian context, though. Generally, the ETF market is not very liquid and the funds needed to build a globally diversified portfolio are not available to retail investors. WeInvest started its commercial services last October, targeting only accredited investors. In March, it launched a pilot project with OCBC Bank to offer the bank’s selected clients an online portfolio management service. The participants who use this service to invest in a portfolio have the option of a goal-based or thematic investing approach. The minimum investment amount is S$3,000. Prabhakara says the response has been encouraging, but declines to reveal its AUM as it is still early days. Last month, the company received the Monetary Authority of Singapore’s approval to include retail investors in its client base. It hopes that this will give its AUM a boost. WeInvest is looking to partner financial institutions and asset management firms in Malaysia. Prabhakara notes that retail investors in the country rely heavily on unit trust products, which incur relatively high costs, hence robo-advisers will be able to help. “I think the Securities Commission Malaysia (SC) realises this. The SC is very proactive. It just launched the new Digital Investment Management framework. This has sparked a lot of discussions among banks and wealth management firms because they see the tsunami of robo-advisers will hit their home ground soon,” he says. Bambu is currently operating in Singapore and Hong Kong and is looking at potential expansion into Indonesia and Thailand. The company can run most of its projects remotely. This allows it to have strategic partnerships with global technology service providers, which enables it to focus on developing the platform and underlying technology. Philips says the robo-adviser industry has no choice but to grow as it represents the digitisation of an extremely large market in wealth management. Like it has been for every other industry, digital transformation is inevitable. AIM’s Lee says the demand for automated investment services in South Korea is expected to grow exponentially in the next 5 to 10 years and reach a market size of US$64 billion. The company plans to establish a presence in other Asia-Pacific countries. AIM’s currently “private beta” platform already has more than US$1 million under management. The company plans to launch its commercial service in the second half of the year. There are more than 5,000 registered users waiting for this service, which could increase its AUM to US$190 million. “AIM is committed to offering our service to high-achieving individuals in Asia — the region with the highest growth rate in emerging wealth. With this growth strategy in mind, we built our operations free of local specifications and regulatory requirements. We will expand our service to multiple markets, including Singapore and Malaysia. The word “robo” in robo-adviser seems to imply that the digital wealth management platform has little to no human interaction as it provides automated, algorithm-driven financial planning services. Robo-advisers have been deemed less valuable than human financial planners due to their characteristics such as limited investment options and one-size-fits-all approach. They have also been focusing mainly on small ticket investors. Despite the benefits of low cost, transparency and convenience, the most common complaint is that robo-advisers do not offer personalised services. Ned Philips, founder and CEO of Bambu, says personalisation in financial services only exists in private banking. In other segments, the human adviser mainly plays a sales role. “Bambu spends a lot of time and effort developing the technology to offer true, fiduciary advice that will be made available to everyone. We use the framework of goal-based investing to provide users with highly personalised financial plans and recommend suitable investments to help them achieve their goals,” says Philips. Robo-advisers, on the other hand, give the average investor a relatively personalised portfolio — based on their risk appetite — for a fraction of the cost. “No one has tried to argue that a robot cannot plan the life of a person who has 17 properties and five yachts worldwide,” Luhaaar jokes. Mikaal Abdulla, founder and CEO of 8 Securities, believes artificial intelligence (AI) technology, used by its mobile application, Chloe, could achieve hyper personalisation. “Human advisers may have biases and are not always rational. AI treats a US$100 account the same as a US$1 million account, depending on the risk appetite of the investors,” he says. Low cost has always been the key selling point of robo-advisers. However, some human financial advisers offer fee-based advisory service and charge clients based on the assets under management (AUM). How does the robo-adviser fare in this regard? Luhaaar says clients must understand that robo-advisers act as both financial advisers and fund managers for their clients. Therefore, the fee based on AUM charged by a human financial adviser is still going to be followed by the fund’s management fee, sales charge and so on. Also, most robo-advisers are able to offer near-zero fee for high-net-worth clients. Robo-advisers are known for serving investors with limited capital or who are just starting out. But with more financial advisers offering services to the same segment, do the robo-advisers still have an advantage? Luhaaar says it would be tough for a human financial planner to spend two hours helping a millennial start investing his US$1,000 and still make a living. By comparison, a robo-adviser can service 10,000 millennials simultaneously. “More importantly, millennials prefer to do things differently. If you understand them, they prefer a well-written Frequently Asked Questions section than having to ask a question personally. I think robo-advisers are still quite competitive in this sense,” he points out. Another complaint is that robo-advisers do not engage in human interactions, which some investors prefer to have. Mikaal says this is a myth as all robo-advisers have a human interaction component. “Clients can always call or chat with a licensed representative on the platform or via the mobile application. In fact, I think robo-advisers are able to provide better interactions because they are more efficient,” he adds. Philips acknowledges that some investors do not care about being overcharged as they want the comfort of human interaction, particularly in times of doubt. This largely represents the current pool of investors, who make up the ageing population. “However, tomorrow’s investors would rather swipe than call, text rather than meet and automate rather than negotiate. If robo-advisers can reframe investing as a part of everyday life that helps you achieve your financial goals, the ups and down of the financial markets are irrelevant as long as you are keeping to your saving and investing plans. If we remove the complexity, it will reduce the need for hand-holding,” says Philips.